OK, I love my bacon! Let me just throw that out there, like really love it! But every now and then even a caveman needs a break from the usual bacon and eggs type breakfast and try something different. As it is winter here in Australia I remembered the old tradition, and the ease of warming up some porridge and taking that big risk of it getting to soggy or too dry and ruined. After having some white quinoa I thought that this surely could make a good quinoa porridge and I was correct! 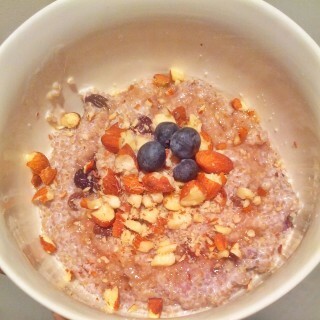 So I introduce my Honey Nut BlueBerry Quinoa Porridge. Yum! That’s a good question you ask and one that I frantically googled around to find the answer and I found conflicting information. I decided after nearly being paleo for 2 years that my own body will be the best judge. When I eat or drink something I shouldn’t, believe me…my body will let me know! So I decided to take the plunge. Not only did this Quinoa Porridge taste great, it left me really full but without the bloating. I continued on with the good vibes and went for a workout and had sustained energy throughout. Not sure what was happening but I was loving it. A few taste testings later and I have determined that it’s fine for my body and that is good enough for me. Obviously the same rule should apply to you. Don’t just jump on the Quinoa bandwagon without being clean for 30 days and then introduce it and see how you go. Also keep in mind it does contain a lot of carbs and if eating clean for weight loss is a primary goal, then this little breakfast will not help! Especially if you have it a few times a week. Keep it as a treat and in moderation and you should be fine. Keep an eye on the simmering quinoa as if you are gone to long the water will evaporate and you will start to burn the quinoa. Breakfast, Recipes breakfast, quinoa, sweet. permalink.